We hope that you all settled well in the new academic year. 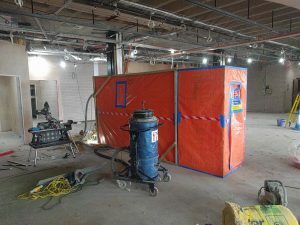 You might have wondered why recently the library was noisier than usual. 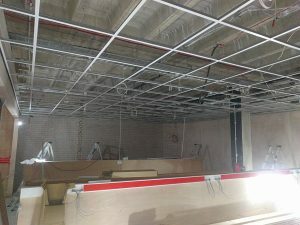 The reason for all the disruptive drilling noise in the library is that our crew has now started working on the ceiling. They will be carrying these works over the coming two weeks. We apologise for the disruption, the noise will lessen as soon as work moves to more decorative finishing touches. 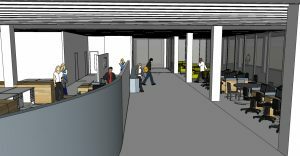 This will be your refreshment area, where you can socialize and have a cup of tea! Currently, we are installing the drop ceiling in there. 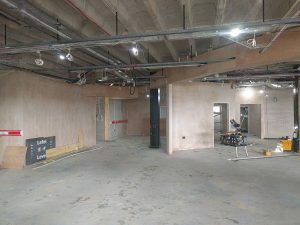 Looking from the refreshment area we can see the cleaning up ready for ceiling grid and the new doorway on the left. 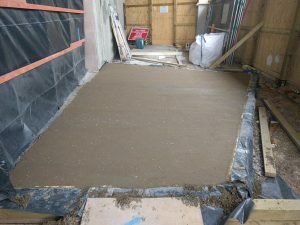 Apart from the ceiling we are also working on preparing the floor for our new carpets. Completing interior walls for staffing area. And font door new lobby frame. We are grateful for your patience and hope you look forward Level D to be re-open in January 2018. We will update you soon, keep checking our blog for the latest refurbishment news! The refurbishment has brought a lot of disruption to Information Services colleagues and they’ve all been so supportive and cooperative in accommodating the refurbishment works. 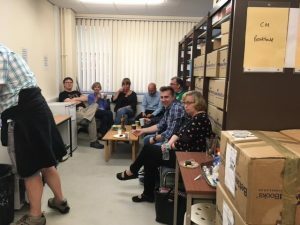 Whether its storing bits of furniture in their offices, cwtching up to make space for colleagues temporarily displaced from Level D or losing the staff tea room for the duration of the works, they have been fantastic. Thank you all. Here are some of them making do in our temporary, makeshift tea room. 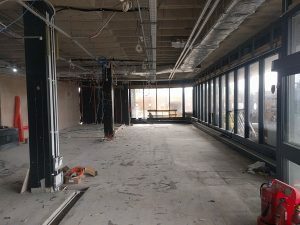 Why is Hugh Owen Library Level D being refurbished? 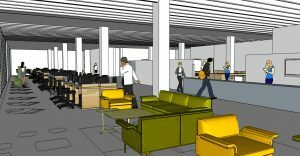 As a result of feedback from library users and the obvious need to update an outdated building, Information Services (I.S.) 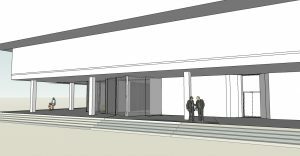 proposed a £2M refurbishment of the Hugh Owen Library over a 4 financial year period, 4 tranches of £500k. The first phase of the work being Level D over 2 financial years (2016-17 – 2017-18), with Level E & F taking the remaining 2 years of the project. 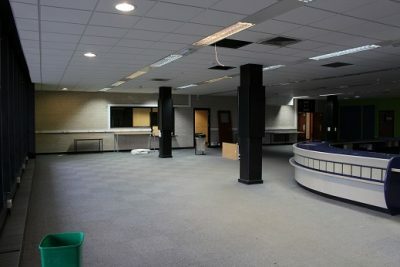 As a key service in the University throughout the year, it is paramount that the library remains operational throughout the refurbishments and it was agreed that we would start first with the main reception area of the Library on Level D.
From regular student feedback, there is a clear requirement to maximise, update and improve appropriate student study spaces on Level D. The space currently feels significantly dated and is no longer meeting user and staff needs. 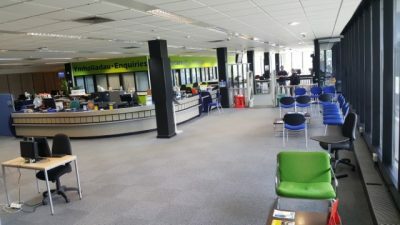 The space for staff working on Level D is cramped and the current layout means those not timetabled to work on the enquiry desk remain on view to users. This results in frequent interruptions to staff and a poor experience for users who may perceive they are being ignored by these staff. While I.S. scored very well in the ‘We Are Aber’ survey, our poorest score was the “The department has visually appealing facilities and/or materials” question for which we scored a 56.7% satisfaction rate; all other I.S. scores were in the 70% – 86% range. 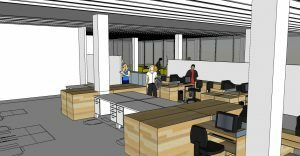 Improving the space and services on Level D, as the Library entrance area and location of the Library and IT Enquiry Desk, would have the greatest impact on current students and is additionally our shop window for prospective students. Reconfigure the layout to improve the flow through the building and user access to facilities and services. This will include moving the main library entrance to face onto the Piazza. Open up and repurpose some of the existing ‘back of house’ areas to provide additional user space. 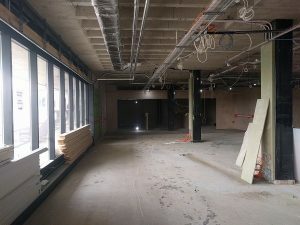 This will include a vending area, additional bookable group study rooms, student toilet facilities and seating for computers and individual and group study. Improve the lighting, heating and ventilation to make a more comfortable environment for our users. Update the decoration and furnishing to provide a modern and well-designed space that meets our users’ needs. 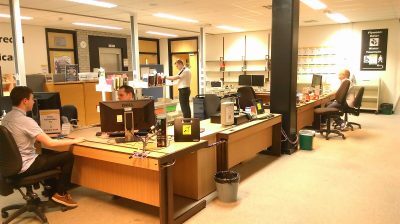 This week our Library & IT Enquiry Desk service opened on Level E of the Hugh Owen Library. This Enquiry Desk is located in front of the main entrance doors on Level E. Staff at the Enquiry Desk welcome your enquiries. We have been busy relocating some book collections and services in preparation for building work to start on Level D of the library. While we have signs up and around redirecting library users to the new entrance of the library and to relocated book and services inside, if you have any problems at all finding books or need any help, please do not hesitate to ask a member of our staff. Thank you to all involved in relocating this service up to Level E. We’re looking forward to building work starting.